The Forest of Dean Regeneration Board met at the historic Speech House to launch the new Cinderford Investment Prospectus designed and produced by established Gloucester agency Litchfield Morris, which outlines the regeneration sites and development opportunities for the Cinderford area. Helen Morris Director of Litchfield Morris who created the innovative design, photography and print production said, "It’s so good to be involved with this prospectus, focussing on real values to change peoples’ lives inviting £100m investment for 1,000 jobs, 400 new homes and 50,000 sqm of developed floor space in the community." The invited launch audience were welcomed by Councillor Graham Morgan Chairman of Cinderford Regeneration Board. Stakeholders, town and County councillors, potential developers and local businesses included Apex Architecture, Bell Homes, Dean Estate Agents, Gloucestershire College, HCA, Rothdean Limited, Trilogy Developments and Vantage Developments. The launch promoted the new vision for Cinderford in 2026, the investment of Homes and Communities Agency and the County Council and an invitation to invest in the development projects. The Cinderford Regeneration Scheme, as Gloucester’s regional success story, and best practice nationally, will be education led with commitment from Dr Greg Smith, the Principal of Gloucestershire College to invest in a new College campus at Five Acres Coleford. Gloucestershire First’s Chief Executive David Owen committed to ensuring Superfast Broadband for the area as a national pilot and a key catalyst for regeneration. Peter Hibberd, the Strategic Director of Forest of Dean District Council emphasised the sustainable quality of the economic development, the BREEAM coding for sustainable homes and The Forest Charter. Peter Hibberd stated "the quality of the regeneration has been well represented by the excellent quality of the prospectus". Councillor Patrick Molyneux brought the speeches to an end with a clear summary of the benefits the regeneration plans will bring not just to Cinderford or Coleford but to the whole of the Forest of Dean as education leads redevelopment for retailers, businesses and tourism, the vision for the Forest of Dean Cinderford Investment Prospectus is aspirational yet achievable. 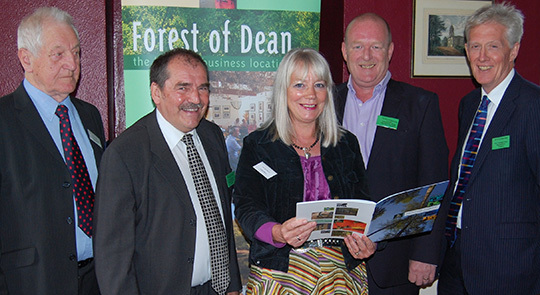 Photograph from left “Councillor Tim Holder, Councillor Graham Morgan, Helen Morris Director of Litchfield Morris, Councillor Patrick Molyneux and GHURC’s CEO Chris Oldershaw with the new Forest of Dean – Cinderford Investment Prospectus”.